President Obama is a fan of Eli’s: One of their jumbo creations was served at the Commander-in-Chief’s Ball at his first inauguration. 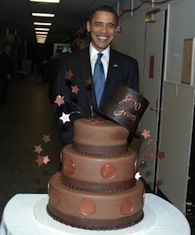 And the President proudly posed with a chocolate-covered Eli’s cheesecake created for President Abraham Lincoln’s Bicentennial Birthday Banquet in February of 2009. President Obama keynoted the dinner in Springfield, Ill., and today America’s #1 Lincoln fan will be re-sworn-in with his hand atop Honest Abe’s 1861 Bible. Masterminded by Eli’s executive pastry chef Laurel Bolger, the three-tiered cake for the Staff Ball is being created at Eli’s Chicago headquarters, and will be covered with 100 pounds of buttercream frosting, decorated with dancing gold stars, a blue presidential eagle, and the inaugural seal. The layers will alternate between two of Eli’s most popular flavors, plain and chocolate chip, company president Marc Schulman, son of founder Eli Schulman, told Obama Foodorama. Chef Bolger and the giant cake layers will travel in a refrigerated truck from Chicago to DC, leaving on Monday afternoon around 3:00 PM, just as the President and Mrs. Obama are marching in the inaugural parade from the Capitol to the White House. After an overnight drive of more than 700 miles, the cheesecake will be assembled at the Convention Center on Tuesday morning, where the finishing touches will be put on, Schulman said. Along with “back up” cheesecakes of six to eight other flavors Eli’s will bring to the Staff Ball, the domed beauty will serve 6,000 people. A spokesman for the Presidential Inaugural Committee declined to specify how many total guests have been invited to the Ball–or what else will be on the menu; organizers have released no details about the event. Superstar Lady Gaga will reportedly headline, however, an “inaugural source” tipped both Hollywood Reporter and AP. Eli’s cheesecakes also starred at two previous inaugural celebrations, served at President Bill Clinton’s inaugural balls in 1993 and 1997, Schulman said. “We took a break during the Bush years,” Schulman said. Clinton and his wife, now Secretary of State Hillary Clinton, visited Eli’s bakery in 1992, and were wowed. The Secretary has a silver palate, and goes down in history as the First Lady who brought contemporary American cuisine to the White House, after a focus on French cooking in the previous decades. Eli’s has also created masterpieces for loads of other celebrations, including current Chicago Mayor Rahm Emanuel’s inauguration (which followed his stint as President Obama’s first Chief of Staff); Chicago’s 150th and 175th Birthday cakes, and for the White Sox World Series Win. Schulman has been in DC since last week, and will be very busy on Tuesday, making sure everything is ready for the President’s final inaugural party. Getting invited to serve food at any presidential inaugural is a rare honor, and Schulman is suitably thrilled. The six-tiered cake for President Obama’s Commander-in Chief’s Ball on Monday night is being created by Duff Goldman’s Charm City Bakery in Baltimore, Maryland. 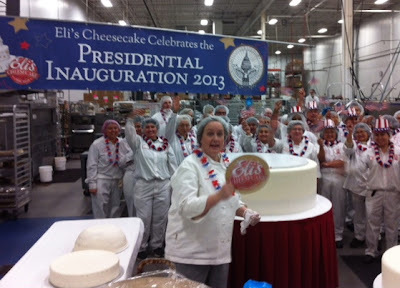 Today Eli’s Cheesecake is sending a Giant Eli’s Cheesecake for the Presidential Inauguration 2013! Weighing in at 500 pounds, this Big Eli’s Cake was made with 155 lb. of cream cheese, 45 lb. of sugar, 20 dozen eggs, 2 cups of pure vanilla, and 100 lb. buttercream frosting, along with substantial amount of other ingredients listed below. 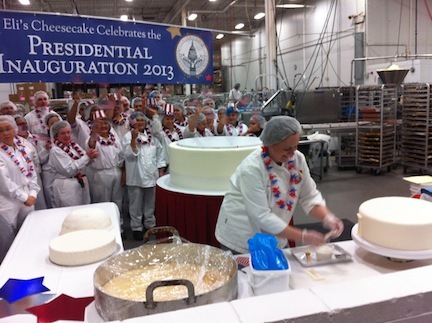 This will be the second cheesecake Eli’s has made for Barack Obama’s Inauguration; Eli’s also made Obama’s First Inaugural Cake. Eli’s Pastry Chef, Laurel Bogel, designed, bake, and hand-decorated the huge cheesecake. 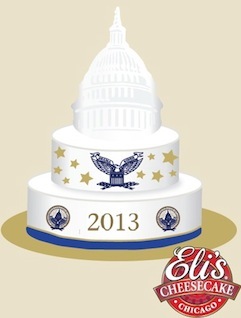 Eli’s is honored to be making such notable cake for a great event in U.S. History. Tags: Inaugural Ball, Inauguration, Obama, President, Washington D.C. This year, Eli’s is teaming up with Toys for Tots to bring a brighter Christmas to children. We are collecting new, unwrapped toys (valued at $5 or more) in our Bakery Cafe until December 7th. As a token of our appreciation, we will be giving out 20% off frozen dessert coupons to anyone who brings in a toy. Please help us bring more smiles to children’s faces this holiday season. This Saturday, November 17th from Eli’s will be hosting it’s annual Thanksgiving Dock Sale! Come early for Dock Busters including Buy One, Get One FREE Marble Cheesecakes. Spend $25 and get a FREE Cheesecake. Doors open at 9am and the dock closes at 3pm. Eli’s was pleased to be one of the sponsors for the Lawson House Honors Event on Thursday, November 1st, 2012. The event was honoring a remarkable history of Board Leadership and Support. Since 1931, Lawson House has provided safe, afforable housing for men and women. Now the largest single-room supportive housing facility in the Midwest, it plays a key role in Chicago’s efforts to address homelessness. But housing is only half the story. Lawson house also provides an array of free social services, mental health and primary medical care to help residents be independent and self-sufficient. These supportive services have been carefully added over the past 30 years through lasting partnerships with area providers. Through their commitment, Lawson House has emerged as a national model of supportive housing. Their success is based in part on the support and leadership of the Lawson House Board of Directors. Here at Eli’s Cheesecake, we are proud and excited to have a New Shopping Site! Our new site has updated graphics and is more user-friendly for an easier and better shop online experience. Check out our new Shopping Site at http://shop.elicheesecake.com/ ! Let us know your opinion of New Shopping Site by sending comments through our ‘Contact Us’ tab and be entered in a raffle to win one of three Eli’s Original Favorites Samplers. Comments must be submitted by Monday October 8, 2012 at 11:59 pm CT to be entered in the raffle. Winner will be announced Thursday October 11, 2012 at 9 am CT. To comment, click the link: http://shop.elicheesecake.com/contact. Happy commenting! Thursday July 19, The Eli’s Cheesecake Company was featured on WGN-TV when they hosted Will Ferrell and Zach Galifianakis. They had the celebrities play the Grand Prize Game with Bozo and all of the prizes were famous Chicago foods. A huge slice of Eli’s Cheesecake was one of the prizes, as well as Robinson’s Ribs, Garrett’s Popcorn, and Al’s Beef, among others. Eli Slice was also present in the fun. Above is a few shots from the segment and a picture of Eli’s President, Marc Schulman, with Will Ferrell.